Orlando, Alisha, and Averille working on their Aquatic Ecosystem Models. So far this year the 10th grade Marine Biology Research students have done a great job of working together to produce exceptional results. Putting together Aquatic Ecosystem Models, they’ve begun to learn the basics of water chemistry, physics, and ecology. From jump starting the nitrification cycle in their Models by adding ammonium chloride and nitrifying bacteria to adding terrestrial plants for nitrate removal, these future environmental scientists are learning what it takes to keep an ecosystem healthy from the bottom up. 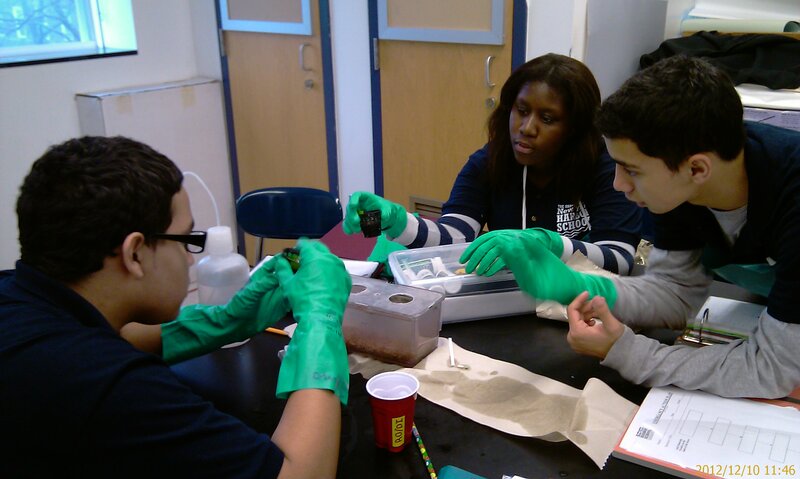 Once these students have mastered keeping their Ecosystems healthy they’ll start formulating projects around the Hudson River Estuary to apply their skills to the real world. Continue here.